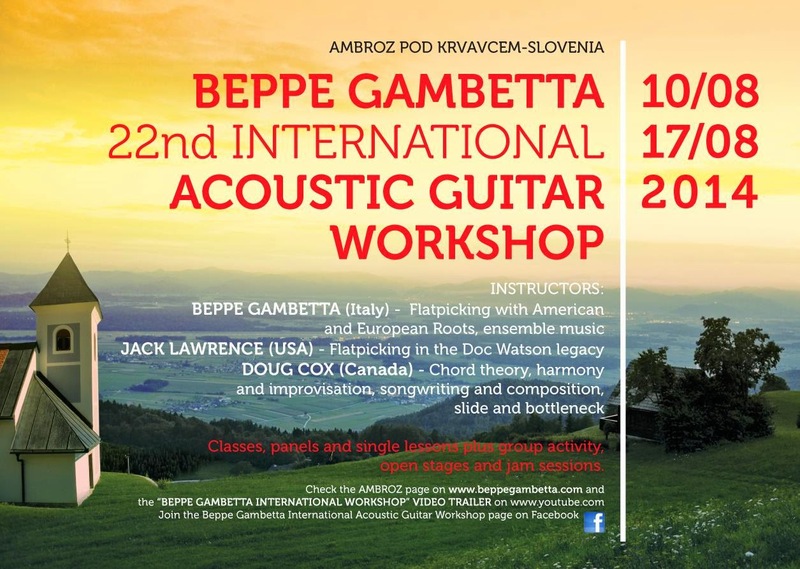 Subscriptions for the 22nd Beppe Gambetta International Workshop (10-17 August 2014) in Ambroz, Slovenia are moving fast! Teachers for this year’s event (in addition to Beppe) will be Jack Lawrence (USA) and Doug Cox (Canada) – with their individual styles they will covering a wide musical territory. It will be exciting to learn from the knowledge and experience of an icon of the acoustic guitar, Jack Lawrence, who partnered the great Doc Watson for 24 years, and it will be equally rewarding to be exposed to the versatility of Doug Cox, one of the most experienced teachers of the North American scene. Beppe will focus on traditional flatpicking from both sides of the Ocean and will talk about creativity using alternative techniques and alternate tunings. The workshops will be involve lessons with panels of the three teachers together, with jam sessions and an open mic in the evenings. Saturday night, after the final show, Beppe will cook his "pasta col pesto" to end the workshop with the traditional taste of his hometown. Many subscribers of this year are "first timers" and come from different nations: so Beppe is expecting an exciting injection of new energies to the Workshop to continue the tradition of generating unforgettable moments and new friendships.